The sewing room became a neglected post-Christmas mess. This morning Benjamin took a nice little nap and I got to work. There is still a lot to organize and move out of here. A. LOT. Reality is I might not get a chance to work on this room for a week, or maybe two weeks, because each day just gets filled to the brim and it is done before I get a chance to breathe or pee in peace. This pretty little corner will probably get untidy in that time because clothes will need to be mended, garments finished and patterns looked through for spring sewing. Kids will grab for knitting needles and scissors, sewing needles will get spilled and thread pulled. And that's okay. As much as I try to teach my kids neatness and order, there are so many more lessons for each day that are more important, right? Right. But for now, I'm thoroughly enjoying a tidy little space to sew. 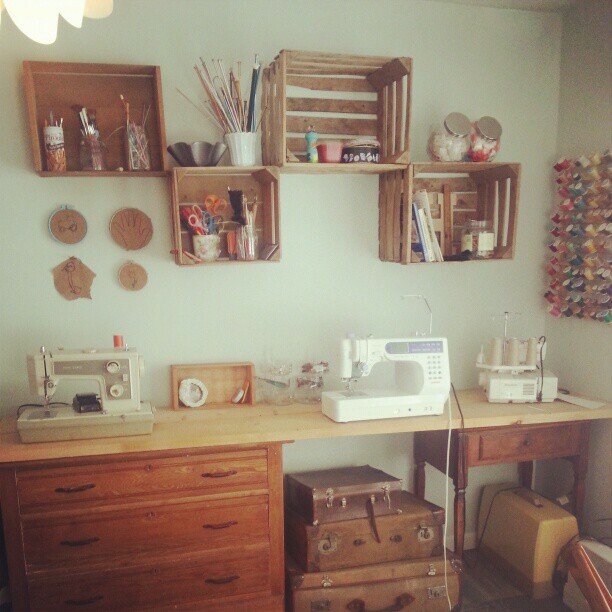 Your blog AND sewing room look marvelous. Haven't been by in a while. Time to catch up! Thank you for this.. I see these pic's on other blogs and it depresses to how my house never looks this nice.. Thank you for the truthfulness of you post..